With having accumulated many special memories over the course of my 35 years of hunting, I can vividly remember so many details. Memories begin with my first successful whitetail deer hunt, my first turkey, and my first harvest with a bow. All of these events pale in comparison to being able to watch my eight-year-old son squeeze the trigger on his very first deer…a spike buck. Like many fathers who love to hunt, my hopes had always been to raise my two children to share my passion for hunting and the beauty of the outdoors. I know many hunters; however, whose children had grown up with little or no interest in following in their father’s footsteps when it came to pursuing wild game. I often wondered what it is that separates those kids who develop the passion and those that do not. There is no sure way of getting or keeping our children involved in hunting, yet there are certain things that we can do to increase the odds of them developing that lifelong passion. Once a child reaches the age where you feel it is the right time to take them hunting, you must make necessary changes to how you hunt. You are going to have to keep it somewhat “fun” in their eyes. It could be a tag-along trip where they sit with you or simply head out to do some scouting. Explain what you are doing and what you are looking for. Allow them to utilize some of the gear, such as binoculars or rangefinders. If you are like me, you may need to shorten the time frame of your hunt. For instance, you may be accustomed to a 4 or 5-hour sit, but now you may need to make it only a few hours to prevent the child from becoming bored. Once you detect boredom, either change things up a bit or head to the house. You may ask yourself, “When is the right time to take your child hunting?” The answer depends on the individual child. I believe it is important to not push them to go until they have shown the desire. 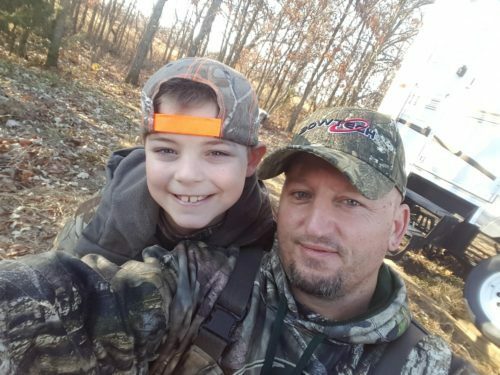 We, as hunters, all want our children to share our love for hunting and the outdoors; however, if you force it on them, you risk driving them farther away. If they do not show as much interest as you would like, then simply give them their space. Always keep the invitation open and never force them to be an unwilling participant. Make sure the child, when the day comes that they are ready, has the correct equipment. Make sure they are comfortable with the proper clothing. Even for seasoned hunters, we know the misery of freezing our butts off while trying to stay out for as long as possible. If it is miserable for us, imagine how much more it will be for the child who is not accustomed to cold temperatures for extended periods of time. You do not want to over-clothe them either. They need to be comfortable with proper fitting clothing. Remember, they so want to be like dad. Make their attire fit the part of a hunter. And just as important as the clothes they wear, is the weapon that they carry or utilize. Proper fit, whether a bow or a gun, is crucial. For a rifle, that means making sure your child can properly shoulder and aim the firearm and that the recoil is not more than they can handle. Assure they are comfortable with it, via practice, and preach the importance of firearms safety. I made sure to allow my son to carry his unloaded weapon to the stand. He held that rifle so tight and walked with so much pride. If your child is using a bow, it is important to assure proper fit with correct draw length and draw weight. If your child is not comfortable with the weapon they are utilizing, they probably will not be able to shoot it accurately or consistently. This can quickly lead to disappointment and frustration with hunting. If you are truly serious about getting your child involved, it is your duty to equip them properly. Just as you would do for yourself. Finally, to keep them interested in hunting, sooner or later, they are going to have to experience the taste of success. 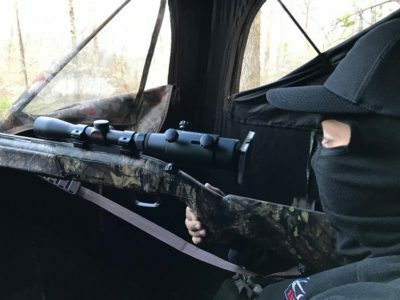 While you and I may be able to sit in a tree stand or blind for hours on end, day after day and never draw back an arrow or push that safety forward, a young child is going to likely deem this boring and lose interest. This may mean that you need to start them out on smaller game or, in my case, place them in a situation where you know they will have a high chance at success in harvesting their first game. Sure, I dreamed of my son taking a nice big buck on his first hunt, but I was just as thrilled when a couple of spikes came in and presented him a shot. After my son dropped the deer in his tracks, I think it is safe to say, he was hooked. He experienced the “rush” that all of us, as hunters, have felt. Now, he does not mind spending a little more time waiting for the next opportunity. When that special day came for just the two of us to make that trip to the field, I felt confident that we had put in the time preparing for a successful hunt. I am testifying that there is nothing more rewarding than watching your child harvest his or her first game animal. The excitement in their eyes, and to feel the pride of knowing that you played a major part in their success, is a feeling like no other. Most importantly, there is a bond that develops between you and your child that makes it that much more special. A special closeness that could only come from time shared afield. A bond that, if properly nurtured, will last a lifetime. Blog post originally shared on “The Break TV”. Bobby is a team hunter on “The Break TV” on the Pursuit Channel. He grew up near Odessa, MO and began hunting at a very young age alongside of his father and older brother. Bobby has also taken up Taxidermy in his spare time and his business is thriving.